1 . This is the field (open air ground) where the largest and the greatest gathering of Muslims takes place every year on 9th of Zilhija (last month of islamic hijra calander). It is called "WAQOOF -E- ARFAT" (stay in Arfat). Muslims offer two combined prayers here under one Azan (Call for Prayer) on Haj Day.The QASAR of (shortened )Zuhar and Asar are offered here jointly just after concluding khtuba-e-haj. If anybody does not attend the gathering of Arfat on 9th Zilhija, his haj will not be considered valid. Haj is actually the name of Waqoof-e-Arfat (stay in arfat on 9th zilhigah) as there is no substitute or penalty (DAAM) If someone does not attend the stay of ARFAT on 9th of zilhija... Rest of the elements of Haj are not so important as it is. Fine ( daam ) may be given against other haj elements, if they are not performed by a pilgrim but Waqoof-e-Arfat is essential at every cost. 2 . As per Muslims beliefs, Arfat will be the ground of accountability on the "Day of Judgement" and every human being has to present himself before Almighty Allah with their acts what they had done during his life. 3 . "Masjid-e-Nimra"----the central mosque of Arfat and the famous historical "Mercy Mount" are also situated in this ground, where the last historic sermon was delivered by Prophet Muhammad (S. A. W.). 4 . For the comfort of pilgrims a number of trees have been planted in this ground which give shades to thousands of faithful in hot weather during Haj Sermon every year. Artificial light drizzle through fountains is showered over pilgrims to minimize the temperature. Yellow coloured high polls pitched to recognize the area of"Arfat". 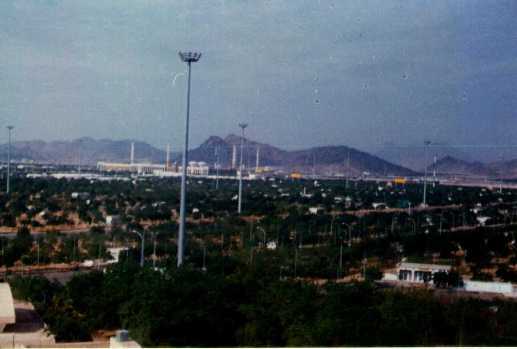 Excellent permanent arrangements of bathrooms and water supply has been made for lacs of muslims during haj. It is really a great achievement of Saudi Government. 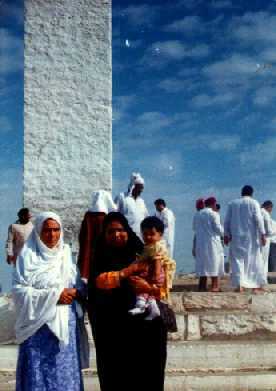 5 .A Pilgrim of haj must has to visit Arfat but for a pilgrim umra this visit is not required. 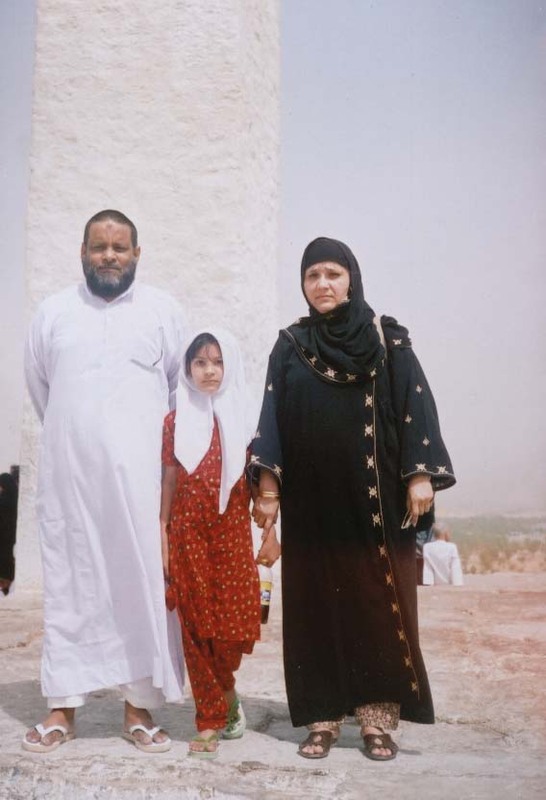 However the pilgrims of umra should try to visit this holy land of Arfat just to see.. Taxis and coaches take pilgrims of umra to show all places of ziara in makkah including Arfat. Taxis and coaches stop here in the bottom of mercy mount and let passengers to go outside. 1 . 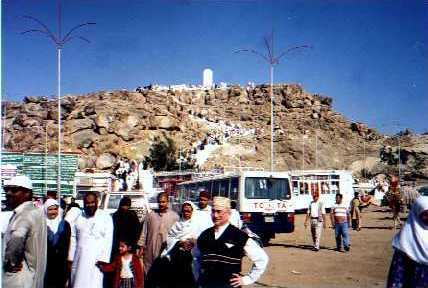 In Arfat there is a mount, named "Jabal-e-Rehmat" where a white pillar is built which indicates the exact point where "Syedna Adam (AH)" and "Syeda Hawwa (EVE) AH" rejoined each other after being separated from Heaven by the order of Almighty Allah. It was the great mercy of Almighty Allah over them and because of this fact this mount is called Mercy Mount (Jabal-e-Rehmat). 2 . Now a days near about 72 steps are built to reach to the top of this mount. Pilgrim can easily go up. Some people offer Nafil (Salat) here on the top but Saudi Government forbids to do so and says that there is no proof that Prophet (S. A. W.) and his companions ever offered any Nafil (Salat) here. 3 . It is said that the Arfat field will be the ground of accountability at the day of Judgement and the balance of Almighty will be fixed at this mount. Pilgrims must not miss to see this mount. It is really an exciting experience. 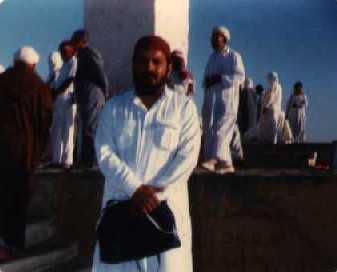 From the top of this mount, Arfat and "Masjid-e-Nimra" is easily visible.